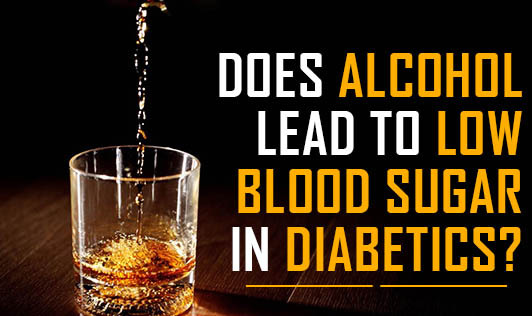 Does Alcohol Lead to Low Blood Sugar in Diabetics? If you are a Diabetic and taking tablets/medicines or insulin injections to control your diabetes, you are at risk of low blood sugar when you drink alcohol. Your face may feel warm and red and you could have a severe low blood sugar, medically termed as Hypoglycemia. How does alcohol cause low blood sugar? * Well, this is something to do with your liver. Normally, when your blood sugar level starts to drop, your liver start its function of changing stored carbohydrate into glucose. * Then, liver sends the glucose out into the blood, which helps you avoid or slow down a low blood sugar reaction. * But when you consume alcohol, this changes. Alcohol is a toxin and your body reacts to it like a poison. * The liver wants to remove alcohol from the blood quickly. So, the liver won't convert carbohydrates to glucose until it has taken care of the alcohol. * If your blood glucose level is falling, you can quickly end up having hypoglycemia or very low blood sugar. This is why drinking as little as 2 drinks of alcohol on an empty stomach also can lead to very low blood sugar. If you take insulin or anti-diabetic medications/tablets, they too work to reduce glucose from your blood. If you do not eat or if your liver does not add glucose to your blood, you could be heading for a low blood sugar level. If you have alcohol it will stop your liver from sending out any glucose and your chances of going low are even greater. 1. Is my diabetes under control? 2. Does my doctor agree that I am free from health problems that alcohol can make it worse? 3. Do I know how alcohol can affect me and my diabetes? If you said "yes" to all three, it's OK to have an occasional drink. But what does occasional mean? It is fine have 2 servings of alcohol in a week, for people without diabetes. If you are a diabetic, it is always best to avoid alcohol. But in unavoidable situation where you have to take alcohol, make sure you have it with your meals and never on an empty stomach.